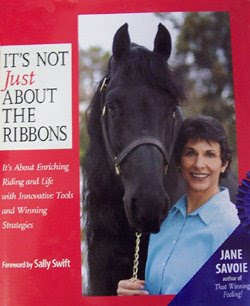 I first heard Jane Savoie speak at an equine expo in New Jersey. In one talk, delivered to hundreds of people, she helped me with a big problem -- competition jitters. Lots of folks experience this. Just before going in the ring, I often found myself shaking slightly, unable to breathe properly or think straight. How did she help? By telling us about the power of our own thoughts. She told her audience about the tapes that we play in our heads, and suggested we "change the tape." In the case of show jitters, for example, she told us we get scared because we think negative thoughts about doing a test in front of an audience. She offered us a better way to think about competing. I can still see her and hear her voice as she assumed the posture of a mounted rider and proclaimed: "Gee, I wish there were some people here so I could perform!" While I laughed at the notion of my training level tests as a performance, her advice stuck. I thought about her words and her sense of humor, and the next time I rode in competition I saw the test as a chance to show off my terrific horse. It wasn't about me! And my nerves were much better. I highly recommend her training series, The Happy Horse, too. I never have a problem with this! Sometimes I do the night before, but unless it's speaking I'm fine in front of a crowd. The horse on the book cover is beautiful, too! 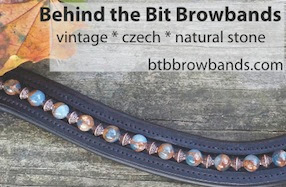 I first became aquainted with Jane Savoie through Practical Horseman, maybe over a decade ago. I will always think of her as The Great Encourager.